It was an "ill-judged attack," a "rash enterprise," as "gross blunder." Such were the terms used by the participating brigades that had been dashed to pieces by a well-protected Federal corps. It was the fall of 1863. A few months earlier the Union and Confederate armies had engaged in a three-way epic struggle at the town of Gettysburg, Pennsylvania (Battle of Gettysburg). Both armies had been badly battered in the battle; neither would be in fighting trim for weeks to come. In the interim, the armies rested and reorganized on the rolling hills between Madison Court House and Culpeper, Virginia. General Robert E. Lee took advantage of the lull in the fighting to dispatch Lieutenant General James Longstreet's First Corps to reinforce General Braxton Bragg in Tennessee. General George G. Meade countered by sending the Army of the Potomac's Eleventh and Twelfth Corps to reinforce Bragg's opponent, Major General William S. Rosecrans. In order to prevent Meade from making any additional detachments, Lee decided to resume the offensive in Virginia. On October 9, Lee led his army across the Rapidan River and moved toward Culpeper in an effort to turn Meade's right flank and impose himself between the Union army and its supply base at Centreville. Meade discerned his opponent's strategy in time, however, and ordered a hasty retreat. 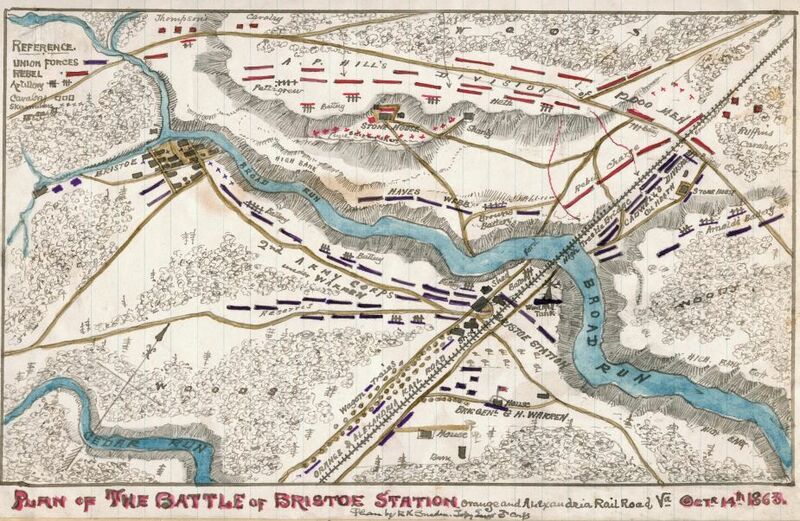 Lee took up pursuit of Meade's army and finally caught up with it on October 14 at Bristoe Station, a stop on the Orange and Alexandria Railroad. Lieutenant General A.P. Hill led the Confederate march. At 1:30 p.m. Hill encountered what he believed to be the tail of Meade's army at Broad Run, about a mile north of Bristoe Station. He decided to attack immediately with his leading division, commanded by Brigadier General Henry Heth. As Heth advanced to attack the Federals along Broad Run, another large body of Union troops appeared on his right, moving parallel with the railroad. With Hill's approval, Heth wheeled his division to the right to meet this new and more dangerous foe. The troops that had suddenly appeared on Heth's flank belonged to Brigadier General Alexander Webb's division of Major General Gouverneur K. Warren's Second Corps. As soon as he became aware of the Confederate presence, Webb threw his men into line of battle behind the railroad embankment, his right flank anchored on Broad Run, his left flank extending across the Brentsville Road. 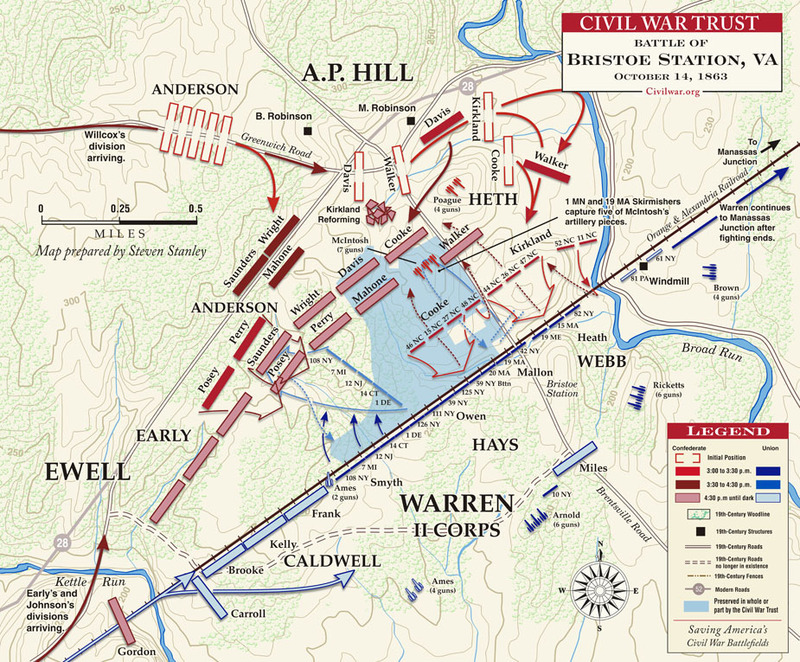 Shortly after the battle began, two other Second Corps divisions, command by Brigadier Generals Alexander Hays and John C. Caldwell, arrived and took position behind the railroad to Webb's left. 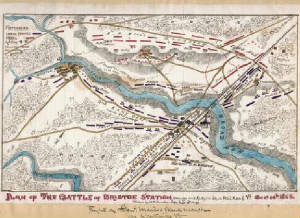 Artillery batteries posted on the high ground south of the railroad strengthened the center and right of the Union line. Heth launched his attack shortly after 3 p.m. Two North Carolina brigades, together numbering approximately 4,000 men, charged headlong into Webb's line of waiting rifles. Despite heavy losses, Heth's division seized a portion of the railroad on Webb's right, near the run. Success was temporary. Union cannon posted on hills behind the embankment blasted the Confederates who had made it past the railroad and effectively sealed the breach in the line. Stunned and demoralized by their defeat, Heth's men retreated back up the shell-torn slope or simply threw down their arms in surrender. While Heth's attack was in progress, Major general Richard H. Anderson's division arrived on the field. Anderson ordered two brigades into action west of the Brentsville Road, while at the same time his artillery chief, Major David McIntosh, opened with seven guns from a ridge just 500 yards from the Federal line. When Heth's division fell back in retreat, McIntosh's guns were left unsupported and were captured by Webb's men, who successfully hauled five of hem safely back to their lines. As the afternoon wore on, additional Confederate reinforcements reached the field. At 4 p.m. Lee arrived with leading elements of Lieutenant General Richard S. Ewell's Second Corps. 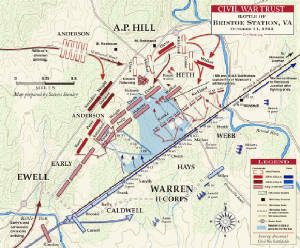 As Ewell moved into position opposite Warren's left, artillery on both sides engaged in a stubborn, but indecisive duel. The last fighting of the day occurred at dusk when Major General Robert E. Rodes' Confederate division attacked Caldwell's division near the bridge over Kettle Run. After dark, Warren crossed Broad Run and continued his eastward march, leaving the Confederate army master of the field. For Lee it had been a costly battle. His army had lost more than 1,300 men in the short, furious fight without any corresponding strategic gain. Federal losses, by contrast, numbered only 546. Responsibility for the disaster lay squarely on the shoulders of A.P. Hill, who had impetuously attacked the Federals without first pausing to reconnoiter the ground. The following day, as Lee and Hill rode together over the bloody-strewn battlefield, Hill sought to explain the previous day's misfortunes. Lee listened quietly, the sad expression on his face clearly showing his disappointment. "Well, well, General," he said, when the younger officer had finished, "bury these poor men and let us say no more about it."